1947 map showing relocation of US 66 over the Colorado River (Photograph courtesy of Caltrans). Route 66 took several alignments over the Colorado River. At first the only way across was by a rope ferry. The Red Rock cantilever bridge was finished in 1890 and carried a transcontinental railroad over the river. Only a few years later, there was a need for a way to get the many automobiles over the river. One solution entailed having cars go over the tracks while trains were not using the bridge. The dangers of this solution are obvious and a better solution was needed. This was the construction of the Old Trails Arch Bridge in 1919. This bridge saw a lot of history - most notably it is the bridge that the "Oakies" crossed on their way to a new life in California. The pictures below show the relocation of the railroad and highway in 1947. 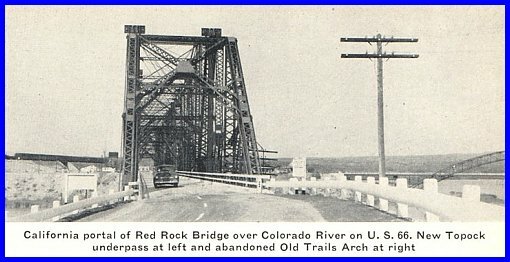 A new bridge was built for the railroad and US 66 was diverted to the Red Rock Bridge; ironically the railroad bridge that was used incidentally for cars became an auto bridge. The Old Trails Bridge was converted to carry PG&E gas and utility lines, a function for which it is still used. An interesting consequence of this is that the bridge has been maintained to a high standard, keeping it in perfect condition. In 1966, the current I-40 bridge was constructed just to the north of the Red Rock Bridge, supplanting it. The Red Rock Bridge was ultimately dismantled in 1978, but the Old Trails Bridge remains. The remnants of the Red Rock bridge can be seen to the west on the old alignment of US 66 - alas, it's only a pile of rubble and twisted steel. "Old construction photo at Red Rock Cantilever Bridge nearing completion in 1890." completed. U.S. 66 crossing the river on the Old Trails Arch (far right) has since been relocated via Red Rock Bridge." My Note (Above): The old alignment of US 66 is visible in the foreground on the left side. Go back to the Cajon Pass.